Having acquired the new to us LG Rebel LTE, I wanted to do a few test shots on the image quality as compared to my FujiFilm XP60. Over the weekend, I recreated a travel blog/topic via DPReview.com where I touched on 2 images of the same setting with 2 different cameras. This morning I’ve edited both of there images as to create a side by side comparison. As one can see, I wasn’t too far off when lining both of these images together. But clearly there are slight difference in color and hue, brightness and clarity. Both Images were taken rough the same time without altering the settings and allowing the camera to take the picture as is. 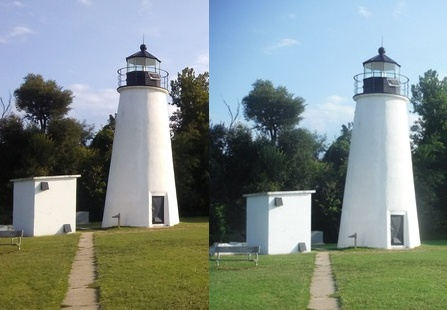 In other words, the image on the left appears to be more like what we saw while visiting the light house. Same color and hue even with the slightly burnt grass.. The LG Rebel has a 5 MP rear facing camera, while the FujiFilm XP60 is a 16.4 MP quality camera. In my opinion, and even though the LG Rebel’s image is slightly grainy, The colors seem more true in appearance that the FujiFilm’s camera. I’ve always said this from the beginning.. The FujiFilm camera seems to create stale or even static images.. and although the LG Rebel’s camera is a bit slow on the upswing.. the image quality is slightly better. thus I may resort to using the LG Rebel more than the FujiFilm. Since that time, I've added a newly discovered app to my LG Rebel and I hope to acquire new images for another side by side comparison in the near future.